Imagine a society in which women are able to have equal participation in driving conversations about issues that matter the most to us. Who supports them? What drives them? Is this the same situation across the world? These are the questions driving the first Voice Knowledge Exchange on the leadership of women in Indigenous Peoples’ and Ethnic Minorities’ struggle for social change and self-determination. Knowledge Exchanges are exciting fora where discussion of emerging issues and trends observed within Voice are explored through different methodologies and lenses. Across different countries and projects, Indigenous women have persisted in pushing their advocacies forward even when other members of the community were ready to compromise. What gives the women the courage to persist? Is a broader change in gender roles and inequality important in this? Is the leadership role of indigenous women being recognised by indigenous communities themselves? By daring these conversations to happen, women from both Africa and South East Asia regions will share/learn what motivates and enables them to take the lead, positioning themselves in conversations at local, national, regional and international fora. Using emergent theatre, we strive to create a culture to mindfully listen to our hearts and bodies through listening or dancing, which propels individuals to open up, thus finding our Voice. As part of the session interactions, we plan to creatively express ourselves through art, journaling and writing. As Voice, we believe that artistic expression captures beautiful voices that would somehow be left behind. 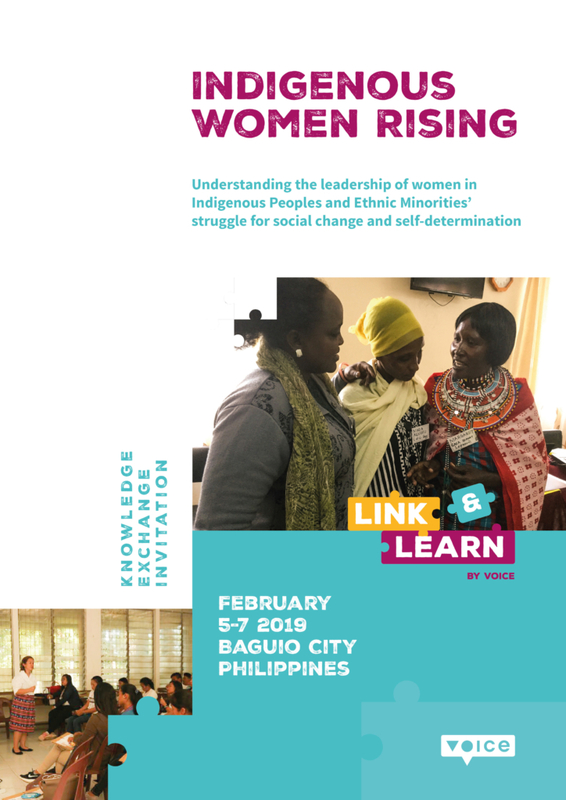 The Knowledge Exchange will bring together indigenous women activists involved in Voice projects from Kenya, Uganda, Rwanda, Philippines, Indonesia and Laos to Baguio City, Philippines from 5 through 7 February 2019. The diverse team will also include researchers from and working with indigenous communities. The nearby community of Itogon will host the second day, allowing us to engage with local realities. This will help identify commonalities and differences, influencing the leadership of women from Indigenous and Ethnic Minorities while understanding the broader change agenda including gender roles and inequality. Click on the image above to see the programme. *Please take note this is a closed event.